I’ve come to realize that I am not a person of habit, I seem incapable of a routine (though I have tried). I am, however, stubborn about traditions. Every year, on December 1st, I hang an advent calendar over the fireplace for my children — twenty-four hand-sewn little bags filled with chocolates and small toys; it’s just the beginning of the Christmas celebration. On the eve of December 6th, I lay out cookies and milk, salt and a carrot for St Nicholas and his donkey; on the 24th, we feast on foie gras and unwrap presents while nibbling cookies and clementines. In February, I make crêpes for La Chandeleur. In spring, I dye eggs for Easter. I cherish these rituals; they shaped my childhood and I wish to perpetuate these memories. And of course, traditions are always good excuse for a party. And so every year, on the fourth Thursday in November, we invite friends for Thanksgiving, and there is turkey and cranberry sauce. This year we were twelve adults and at least as many children, seated around a single long table. I made the same meal as last year, with a different soup to start. And, like last year, each guest brought a dessert. In the past, the timid offering of one pumpkin pie, one pecan pie, and perhaps an apple crumble were usually picked at somewhat wearily, but pulling out a huge spread of desserts (after a small digestive pause) has the unfailing ability to revive the party. My deepest thanks to everyone for the apple pie, the pecan pies, Mamyvonne’s chocolate cake, tiramisus, profiteroles, pavlovas and more sweet bites, as well as Thomas’s (as he won’t tire of telling anyone willing to listen) “award-winning” pumpkin pie (the award in question being a company bake off — but still). It was a merry dinner, which, rekindled by an unreasonable amount of desserts, extended with dancing late into the evening. Two days after Thanksgiving we drove out to Montauk for the day. It brought back memories of another Thanksgiving trip to the beach, some ten years ago. Back then there was leftover pumpkin pie eaten from the hood of the car in a deserted gas station on the way to Cape Cod; an unusual bed and breakfast in Provincetown, memorable in unexpected ways; long walks on the deep yellow sand where seals lolled in the low November sunlight; silly shortcuts through the icy water and tears of pain from thawing feet; two days of glorious weather and the drive back to New York in the pouring rain. This year in Montauk, the children found smooth stones and carried huge glistening rocks for hours. A fisherman teetered on a rock swept over by rippling waves. 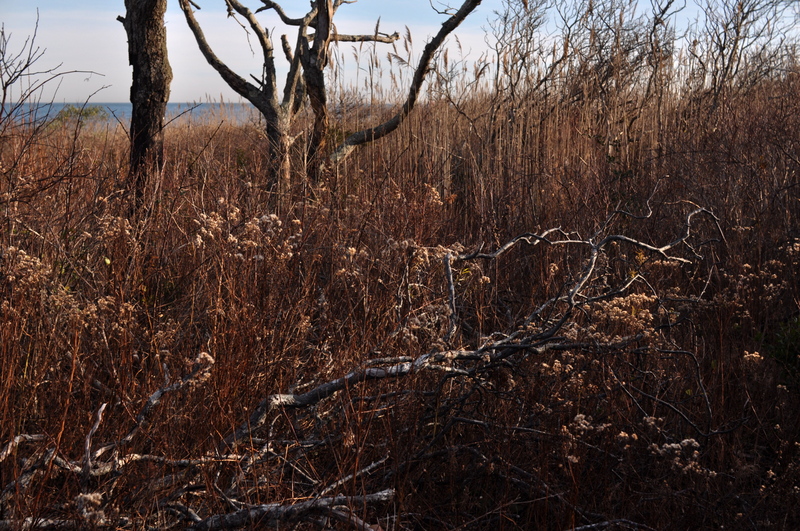 We followed a path through the thorny brush that withered away into damp reeds. It was so warm we might have jumped into the sea. Different years, new friends, interwoven memories. The story behind this overemphatically named pumpkin pie goes like this: my mother used to make it for Thanksgiving. When she handed me the recipe, she titled it “Best Pumpkin Pie,” and I’d be hard-pressed to disagree. Some years ago the pumpkin pie became Thomas’ Thanksgiving prerogative. One year he entered it in his company’s bake-off and won first prize — unanimously, he claimed. It is the best pumpkin pie I’ve ever tasted. It isn’t cloyingly sweet or overspiced. It has a clear crisp lemony taste that is completely delicious. Prepare the pie crust, roll it out into the pan, and keep it in the refrigerator while making the batter. To make the pumpkin purée: remove the skin and seeds from the pumpkin (or squash), cut the flesh into large wedges, and steam for about 20 minutes until soft. Blend or press through a food mill to obtain a thick, smooth purée. Combine the eggs, sugar, salt, spices, lemon zest and juice and beat well. Stir in the pumpkin purée. Add the cream and beat well. Pour the batter into the pie crust and slip into the hot oven. Bake for 10 minutes, then reduce the heat to 350°F (175°C) and bake for 40 to 45 minutes. The pie is ready when a knife inserted in its center comes out clean. This entry was posted on 2 December 2011 at 13:03 and is filed under Dessert, Fall, Holidays, Seasonal, Thanksgiving. You can follow any responses to this entry through the RSS 2.0 feed. You can skip to the end and leave a response. Pinging is currently not allowed.